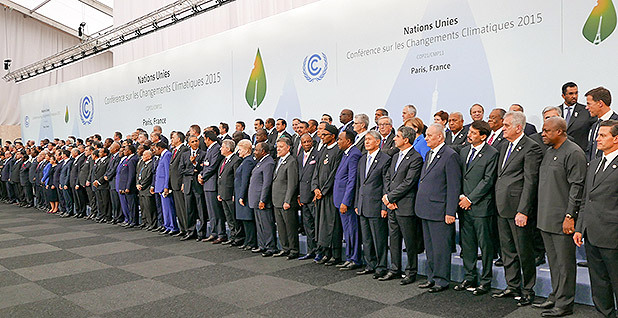 A "family portrait" of the nearly 150 world leaders who gathered in Paris in 2015 to develop a global climate change agreement. Most countries say they still want the United States in the picture. Photo by the Mexican presidency, courtesy of Wikipedia. The world is prepared to put up with quite a lot to keep the United States in the Paris climate deal. If White House officials who want the United States to remain part of the 2015 agreement prevail in what appears to be an ongoing tug of war within the administration, the trade-off is likely to be weaker emissions commitments and no new climate aid for the remainder of President Trump's term. Even then, the administration could make new demands in forthcoming negotiations that could complicate the delicate deal among nearly 200 nations. Still, most climate diplomats and environmentalist observers say they would rather deal with a Trump team than lose the United States altogether. "I don't think it would be seen as an advantage to have the United States out, if for no other reason than that countries will be very hopeful that this is a time-limited bump in the road," said former State Department Special Envoy for Climate Change Todd Stern. "And it is a lot more useful to have the U.S. still in the regime, so that when things eventually turn around in Washington, then the U.S. is there, rather than you've got to go through the whole aggravation of them not being there." Trump this week essentially hollowed out the U.S. Paris pledge when he signed an executive order rolling back Obama-era greenhouse gas regulations that formed the basis of America's international commitments. A new target, or "nationally determined contribution" (NDC), to Paris would likely accompany any decision to stay in the deal, and analysts believe it will be an emissions range consistent with a business-as-usual scenario. The next weeks are expected to settle whether Trump will stay or go. But a State Department team will attend the next midyear climate talks in Bonn, Germany, a first foray that might shed some light on whether the new administration would assume a role of benign neglect or of outright obstruction if it stays. Even if Trump does move to withdraw soon, the process will take four years, during which time his team could still attend talks and play an active, if diminished, role in setting the rules of the road. Battle lines within and around the administration are not clearly drawn. Over the weekend, U.S. EPA Administrator Scott Pruitt dismissed Paris as a "bad deal" in on interview on ABC's "This Week," while EPA transition team leader Myron Ebell attacked Secretary of State Rex Tillerson as a "swamp creature" in remarks at a Washington conference for saying during his Senate confirmation process back in January that the United States should maintain a "seat at the table" on Paris. It's unclear what role, if any, Tillerson is playing in this decision, which will ultimately be made by Trump himself, either with the usual input from advisers or without it. But Trump's daughter Ivanka Trump and son-in-law Jared Kushner were instrumental in slashing language from yesterday's executive order rolling back domestic climate regulations that would have set the wheels in motion for a withdrawal from Paris. And several members of Trump's National Security Council argue for remaining in the deal for pragmatic reasons. Senior adviser Steve Bannon does not. Still, Stern said he assumes that if the United States remains in the deal, it will not try to ruin it from within. "I don't think that they're going to diabolically say, 'Let's stay in so we can throw bombs,'" he said. "A seat at the table doesn't generally mean a seat at the table with a grenade in your hand," Stern added. Still, he acknowledged, if the new negotiating team were extraordinarily unconstructive, that might prompt some partners to wish it had just made an exit. Should the U.S. help write the rulebook? But a future administration might find it complicated to re-enter Paris, while an exit from the underlying U.N. Framework Convention on Climate Change (UNFCCC) would likely mean the United States would have to stay out of the deal for good. It would be very difficult for a future administration to wrangle 60 Senate votes in the future to rejoin the treaty. And a regime without the United States is likely to be less effective in the long run. "I can't envision a world in which it would be better for the U.S. to pull out in terms of keeping the agreement together or keeping others on board," said Kate Larsen, climate director of the Rhodium Group and a former State Department negotiator during both the George W. Bush and Obama administrations. "If the U.S. were to pull out, you would have to believe that at some point, later in the future, when a more sympathetic president is in place, that we'd be able to either rejoin the agreement or negotiate a whole new one," she added. Paris was the culmination of more than two decades of negotiations that eventually included 196 parties, and that included many setbacks and false starts along the way that threatened to capsize the process. The United States was frequently a pariah in the process, but usually for arguing, across Democratic and Republican administrations alike, for provisions on transparency, common responsibility across developed and developing countries, and the avoidance of binding language that would require Senate approval for the United States to join. If the United States were to suddenly withdraw from the process, Larsen said, "the voices for including elements that are problematic for the U.S. get stronger and ultimately win out." If the United States is not active over the coming two years as the Paris rulebook is being negotiated and written, the next administration could return to a process that has become difficult to join. Stern noted that the Paris accord made substantial new progress in breaking down past barriers between what the process demanded of developed and developing participants and on transparency — gains he said the United States should continue to guard in the implementation phase. Climate diplomats and negotiators approached for this story were generally reticent to speak on the record about the future of U.S. participation in Paris. Some worried about being seen to weigh in on domestic U.S. politics, while others feared weighting the scales toward a U.S. exit. Officials from Europe and elsewhere say they're still assessing who their counterparts are within the Trump White House and State Department. "It's not under discussion with key climate diplomats," said Christoph Bals of Germanwatch. "They have lots of problems at the moment to find a person in the U.S. government who has a mandate to negotiate this with them. And they are absolutely frustrated in our chancellery that they don't know who the right person [is] to negotiate those kinds of things." Maros Sefcovic, vice president for the compact's Energy Union, did meet with White House officials earlier in the month, and German Foreign Minister Sigmar Gabriel met with Tillerson and Vice President Mike Pence in February to discuss the agenda his country has set for its presidency of the Group of 20 nations this year, which includes climate change. German Chancellor Angela Merkel is said to have a personal stake in a strong climate outcome for the G-20, but has so far avoided putting Trump on the spot. She raised climate change during a closed-door lunch with the president during her visit to Washington earlier this month, but did not make a public statement about it. And the Germans watched as Treasury Secretary Steven Mnuchin stripped long-established language from this year's financial ministers' communiqué for the G-20 that called for the removal of trade barriers, while he banded together with Saudi Arabia's minister to cancel all reference to climate finance. Greens hope climate aid will reappear at the leader-level summit in July, together with a reaffirmation of the Paris deal, but Maeve McLynn of CAN Europe said Mnuchin's heavy-handedness did not bode well for how the United States might perform in upcoming climate talks. "This is what I'm kind of fearing, that the U.S. will come in and not be willing to compromise on certain things," she said. Both the G-20 and the climate talks operate on consensus, and the United States plays an outsized role. McLynn said that Europeans are dealing with the uncertainty in Washington by engaging more deeply with other countries. The 28-nation bloc could announce new bilateral efforts with China, Latin America and other nations at summits later this year, and is weighing whether to increase its commitment to climate finance in response to a retreating United States. Outreach to Canada and Mexico is also part of the strategy. "The message we're getting is, 'Let's not focus too much on Trump and the Trump administration, but then let's start building and strengthening the alliances with the countries around the U.S.,'" said McLynn. Foreign officials are not offering direct criticism so far of Trump's domestic climate moves, though they seem to be holding fire until the Paris announcement is out. Jake Schmidt, international climate change director for the Natural Resources Defense Council, said Europe, small island states and other members of the so-called high ambition coalition would be unlikely to accept a weaker NDC without comment. "Pretending like there's no blowback to changing how you act on climate change is a bit delusional," he said, predicting that a change in Paris commitment would spark a diplomatic pushback. Dennis Clare, who has negotiated on behalf of small island states within the UNFCCC process, said a major emitter like the United States would set a dangerous precedent if it were to pare back its already-insufficient NDC, though an exit from the deal would "go one step further." "Most countries would surely lament any diminishment of the collective global response to climate change and the increased human suffering that would cause," he said.